Oh, Kickstarter, you so silly! 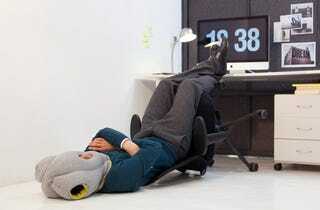 Does this 'ostrich' pillow not look more like a crime scene than an aid to rest? I admit, I have a paranoia about shutting out the rest of the world while it can still reach over the armrest and crab my crotch, but this sets off all sorts of inchoate claustrophobia as well. I think I will flop over onto the cold hard plastic of the tray table in front of me instead, actually.